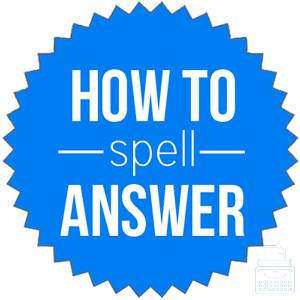 Spelling of Answer: Answer is spelled a-n-s-w-e-r. Definition of Answer: An answer is a response to a question—either written or spoken. An answer is also something that is done in response or reaction, and, a solution to a problem. To answer is to write or speak as a return in response to a question, to act in response, and, to be liable or accountable (for something). Pronunciation of Answer: Answer is pronounced ann-sur. What does answer mean? The word answer functions as a noun and a verb. An answer is a reply to a question, a solution to a problem, and,something that someone does in response or reaction to someone or something else. As a verb, answer can be used transitively and intransitively. The verb answer refers to responding to someone’s question, speaking or writing in response to something, and solving or offering a solution to a problem. I did answer all their questions, but they didn’t seem satisfied with my responses. All the able-bodied and healthy men – young and old – answered the call to war. After he correctly answered the riddle, he acted rather haughty. Additionally, to answer is to make amends for or take responsibility or accountability for. After years of hiding, the middle-aged man was tired and finally decided to answer for his crimes. The lender would never let him get away or refuse to answer for his debt. Answer to: to report to a boss or superior. Who do you answer to here? (Won’t/don’t) take no for an answer: refuse to accept a negative response to a question or request. Answer the call of nature: to go to the bathroom. Answer the door: open the door; greet someone at the door. Answer to someone’s prayers: the solution to one’s prayers or problem(s); wanted for a long time. The word answer first appeared in English sometime before the 12th century, according to Merriam-Webster’s. Answer comes from Middle English via Old English andswaru, which is akin to Old Norse andsvar, meaning answer, and to Old English and-, against and swerian, meaning to swear. Where it means something written or spoken in reaction to a question or request, the following words may be substituted for answer, if the context allows. When answer is used to refer to the accomplishment or resolution of a problem, the following words can be substituted. As it refers to an action or behavior done in return to another, the following words can replace answer. The word answer can function as a noun and verb. As a verb, it can be used transitively and intransitively.